Delhi is different from Mumbai. Less traffic, less children coming up to the car windows at intersections, less litter, fewer dogs, more cows, more monkeys. 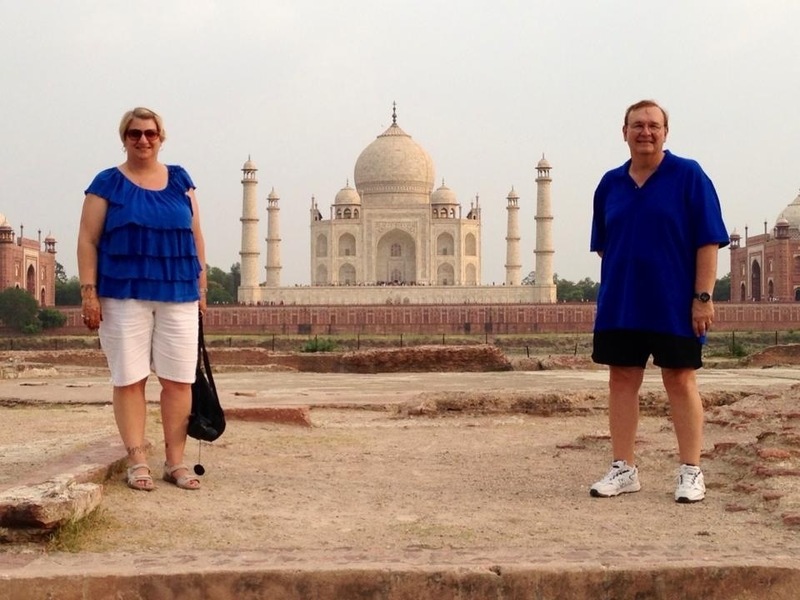 People want to have their pictures taken with us in Delhi and Agra. I got stopped at the airport by a couple today, each of whom wanted their pictures taken with me. We have all been stopped more than once for this. There are cows in Delhi, but even more in Agra. And monkeys. And goats. And camels. And at least one elephant. I feel like my blonde hair sticks out so obviously here. Sometimes when we are out someplace we get separated from each other. People will get in between us. I can’t believe that people haven’t figured out that we are together. We get stared at a lot. I just find it hard to understand what makes us novelties. I see Indian people in he USA all the time and I don’t stare. Can’t figure out why we seem so unique. I love the clothes that Indian women wear. They are so,light and comfortable looking. The colors are vibrant and bright. The fabrics are gorgeous. While I adore many of the sarees I see, as much as I want one, I don’t see myself getting much use out of one. But the other outfits I see often, called kurtas or kurtis, I believe, I would wear the heck out of those! They are on my to-buy list before I leave. We had a CRAZY driver in Delhi and Agra. He drove so fast and weaved in and out of traffic, passed on the other side of the road, and was constantly on the horn. The 4 1/2 hour drive from Agra to Delhi today was harrowing. My jaw hurt from clenching my teeth. He drove recklessly. There is no other way to describe it. I found myself wondering why what would be considered downright dangerous at home was acceptable here. Ahmed is an aggressive driver, but he is not crazy like this guy was. The Taj Mahal is beyond description. If you’ve ever seen the White House, then you know how surprised you were to see how small it really is in comparison to how big you thought it would be in reality. Well, the Taj is that in reverse. You probably think it’s relatively small, but it is more massive that you can imagine! It is a mausoleum Shah Jahan built for his favorite wife, Mumtaz, whom he loved very much. They married when she was 19. They had 14 children. Only 7 survived. She died at age 39 during childbirth. Before she died, she asked three things of her husband. One, hat he not marry again. Two, that he take care of the children and her family. And three, that he build a monument as a testament to how great their love was. It took 22 years to fulfill the third part of her request, but the Taj Mahal was built as that testament. When Shah Jahan finally died, he was also buried there next to her. They are there to this day. It’s actually quite a romantic story, and an experience I will never forget. My father and I at Moonlight Gardens with the back of the Taj Mahal behind us.